Second Blogiversary and Sarabeth's Preserves Giveaway! Happy birthday to you... happy birthday to you... happy birthday to Mission: Food... happy birthday to you! Today, Mission: Food turns TWO!! I can't believe it! In the past two years there have been ups and downs, lots of fun exploration in and out of the kitchen, and many lessons learned. Some of my readers have been part of this world from the very start, and some of you are only now discovering it. I want to thank all of you for being a part of Mission: Food, because Mission: Food is such a big part of me, and I look forward to every word I share with you all. Some of you may recall a review I wrote last October for Sarabeth's Bakery: From My Hands To Yours in which I not only discussed the cookbook in depth, but also relayed my experience of meeting Sarabeth herself at the book release party. As Mission: Food's second blogiversary was approaching, I decided to contact Sarabeth and ask if she'd like to donate some of her award-winning preserves in a giveaway to celebrate this momentous occasion. She happily agreed to share a Gift Sampler Box, which includes six 4-ounce jars in a variety of flavors: Orange-Apricot Marmalade, Plum-Cherry, Strawberry-Raspberry, Mixed Berry, Pineapple-Mango, and Peach-Apricot. To enter the giveaway, simply leave a comment telling me which flavor you are most anxious to try! In addition to this mandatory entry, there are several ways you can have bonus entries... do one of them or all of them, up to you! For each bonus entry, leave a separate comment telling me you did it. You do NOT need to have a blog to participate, but you MUST include your email address with your comments (just fill it out where it says "email" and it won't be visible to the public) so I can contact you if you win! 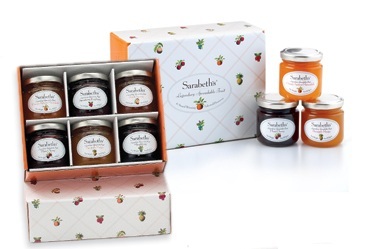 Leave a comment telling me which flavor of Sarabeth's preserves you are most anxious to try if you win. 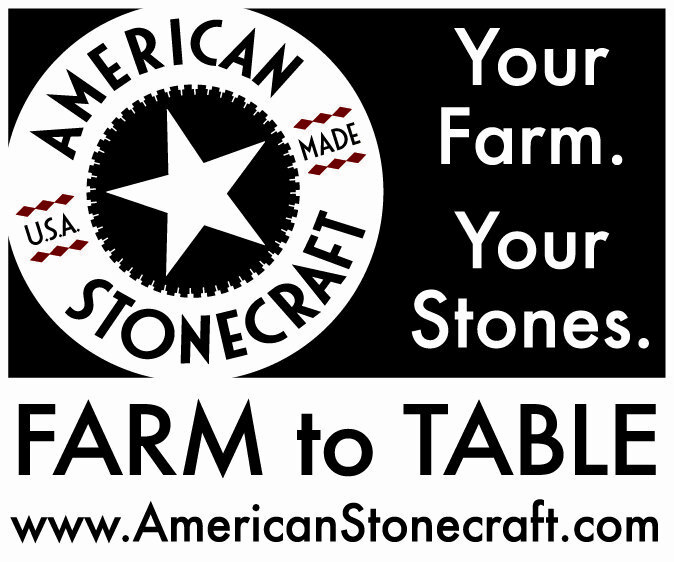 Follow me on Twitter @missionfood, Tweet about the giveaway (include a link to the post), and leave a separate comment. If you already follow me, Tweet about the giveaway and leave a comment. That's up to 5 total chances to win! Just leave separate comments for each entry. The giveaway ends at 11:59 pm EST on March 7th, in exactly 1 week. A number will be assigned to each qualifying comment and then a winner will be selected using a random number generator. I wish you all the best of luck! This is a really fun prize that I think everyone can enjoy! Thanks again for your patronage and good luck to everyone! Lyin' Ryan: The night before, I went to this restaurant to get a basket of these things called Fries Quatro Queso Dos Fritos. You know, the ones where they inject potatoes with a four cheese mixture, fry them three quarters of the way, pull them out, batter them, fry them again, and then serve them with bacon and an ancho chili sour cream. Anyway, as I was sitting there, a car speeds right through the storefront across the street. It makes such a loud noise, I had to turn my head and look and that is when I overheard the guy with the curly-Q's on his face tell the other guy at the corner table about the assassination plot. Shawn: Can this be true? Shawn: I mean, is it even possible? Gus: I couldn't imagine it. Shawn: There's no way you can prepare a fry like that. That'd be way too much for the human palate to manage. Oh, yes it is possible! Later in the episode, the twosome actually go to the restaurant where Lyin' Ryan ordered these, and try it themselves. Immediately, my friends and I knew we had to make these "Twice Fried Fries with Four Cheeses" ourselves. We Googled and found that a couple people had made these, but we didn't like their methods. And although Lyin' Ryan describes these as being battered, in the episode they definitely appear to be breaded as opposed to battered. We took this as an oversight by Ryan (who is a compulsive liar anyway), and decided to bread ours instead, as it obviously was on the show. We used regular dried bread crumbs, because that is how it was made in the episode, but next time I would tweak the recipe and use panko instead because it's much crunchier! We also used cayenne pepper because we didn't have ancho chili powder, but you can use whichever one you have on hand. Shawn, from Psych, suggests trying these with lemon garlic aioli, but we'll let you be the judge of that :) Oh, and P.S., it doesn't travel well! Muahahahahaaa!! Fill a Dutch oven 2-inches full with the oil and heat to 350 to 375 degrees F.
With a paring knife, lightly score 1 potato on its side and then slice it in half perpendicular to the score mark. This will help you know exactly which way to replace the potato halves. Use a small ice cream scoop or melon baller to scoop out the inside of each potato half, leaving no more than 1/4-inch of potato inside the skin. Season the inside of each half with kosher salt, and then densely pack each half with 1/2 to 1 tablespoon of shredded cheese (that's about 1 to 2 packed tablespoons per potato), depending on the size of the potato and its cavity (pack the cheese really well because when it melts it will shrink). Place the halves back together, using the score mark as a guide, and secure with a couple toothpicks. Repeat with the remaining potatoes. Using a slotted spoon or spider skimmer, gently place a few of the stuffed potatoes at a time into the hot oil. Fry for about 8 to 10 minutes or until tender (a toothpick should be able to pierce through the potatoes easily). Remove fried potatoes to a paper towel-lined plate and repeat with the remaining potatoes in batches. Carefully remove the toothpicks, and allow the potatoes to cool slightly before proceding. Meanwhile, make the sauce by stirring together the sour cream, sliced scallions, and cayenne pepper. Fill one bowl with flour, one bowl with the beaten egg, and one bowl with the bread crumbs. Season them all with salt and pepper, and season the bread crumbs with some cayenne pepper as well. This will be your breading station. One by one, dredge the potatoes in the flour mixture, shake off excess flour, coat with beaten egg, allow excess to drip off, and then finally coat with the bread crumbs. Set aside on a plate until ready to fry. When all the potatoes have been breaded, and the oil is back to the correct temperature (350 to 375 degrees F), use the slotted spoon or spider skimmer once again to gently lower the breaded potatoes into the oil. Fry for 1 to 2 minutes until golden. Remove to a paper towel-lined plate and sprinkle with salt to season. Serve Fries Quatro Queso Dos Fritos with the chili sour cream and crumbled bacon, and garnish with more scallions if desired. This past weekend, my 2-year-old nephew Alex baked cookies for the first time! With my help :) He has had his own play kitchen for almost a year, and loves whipping up fake food for us to eat (he even often seasons his creations with salt and pepper, without our suggestion). I figured it was about time he become my adorable little sous chef, and help me cut out some fun sugar cookies. This recipe comes from the "Crisp and Crunchy" chapter of Martha Stewart's Cookies , which is perfect for making cookies that will be cut into shapes, and can easily be decorated with royal icing, if desired. They are definitely on the crunchy side (especially if you accidentally over-bake them), which is perfect for cookies that will hold their shape and lend well to decoration. If you prefer big, soft, chewy sugar cookies (that I personally love), I suggest you try these giant old-fashioned ones that are from the "Soft and Chewy" chapter of the same book! You can't cut them into shapes, but they taste delicious! Alex's first cookie ever! A deformed star :) It's missing one of its points, but it's still perfect! I decided to keep things simple, and offered my nephew Alex a variety of cookie cutters to choose from. I simply sprinkled cinnamon-sugar over the raw cookies before baking, for a light sugary touch with a hint of cinnamon speckles. This is probably the most casual way to dress up these cookies, and if you want to take the time to make royal icing, mix various colors, decorate the cookies, and then allow them to dry overnight before serving, then by all means, I hope you will! I didn't really have the time to do that this time around, and also I think Alex isn't quite old enough to pipe royal icing by my side, but perhaps one of these days he will! I didn't actually make the royal icing recipe below, but it is the recipe from the book so I've included it just in case anyone wants to try it. Also, I halved both recipes, as the one in the book makes a much larger quantity, and also specifies to use 4 to 5-inch cookie cutters, which are larger than any of the ones I own. For more average-sized cookie cutters (about 2 to 3-inch or so) this amount of dough will yield plenty of cookies! We got just under 4 dozen! Teddy bears, and pigs, and seagulls, oh my! Add butter and sugar to the bowl of an electric mixer fitted with the paddle attachment, and mix on medium speed until pale and fluffy. Mix in the eggs and vanilla until well combined, scraping down the sides of the bowl as needed. Reduce speed to low, and gradually add the flour mixture until combined. Remove the dough to a large sheet of plastic wrap, and flatten into a disc. Wrap with the plastic wrap and refrigerate until firm for 1 hour to overnight. Preheat the oven to 325 degrees F with racks in the upper and lower thirds. Let the disc of dough sit out at room temperature for 5 to 10 minutes, until it softens just enough to roll it out. Roll out the dough on a lightly floured surface to just under 1/4-inch thick, adding more flour as needed to keep the dough from sticking to the board or rolling pin. Cut out the cookies with a 2 to 3-inch cookie cutter, and arrange them 1 inch apart on parchment paper-lined sheet pans. Roll out the scraps and repeat. Top with cinnamon-sugar if desired, or leave plain to decorate later with royal icing. Bake, switching pans from front to back and top to bottom halfway through, until the edges just start to turn golden, about 15 to 18 minutes. Let cool on sheets on wire racks. If decorating with royal icing: tint icing with food coloring, if using. Decorate as desired with the icing, and add sanding sugar on top if you'd like. Allow the icing to set on the cookies overnight. Decorated cookies can be stored between layers of parchment paper in an airtight container for up to 1 week. Combine the ingredients in the bowl of an electric mixer fitted with the paddle attachment. Mix on low speed until smooth, about 7 minutes. If icing is too thick, add more water; if too thin, beat icing 2 to 3 minutes more, or add more confectioners' sugar a tablespoon at a time. Use icing immediately or store in an airtight container up to 2 days (icing hardens quickly when exposed to air). Beat well with a rubber spatula before using. I whipped up some Peanut Butter-Filled Chocolate Cupcakes from Martha Stewart's Cupcakes cookbook. I had never made this recipe before, and although the result tasted good (rich, dense, dark chocolate with a touch of peanut buttery goodness), it was disastrous in my oven. For this reason, I am not going to share the recipe. The chocolate batter was very thick (no biggie), but then I was supposed to spoon some peanut butter filling onto it, then top with more chocolate and more peanut butter filling, and then swirl it together. The chocolate batter was too thick for the peanut butter filling to really sink into it. Therefore, it became more like layers of chocolate and peanut butter than an actual filling. While the rich chocolate batter baked up and held together quite well, the peanut butter filling oozed out during the baking and even dripped into the oven. Not fun. I managed to trim the cupcakes after they were done cooling, and they looked a lot less ugly, and actually tasted pretty amazing, but I would never make them again because of how badly they baked up overall. I followed the instructions implicitly. In any case, ugly or not, I will happily snack on these rich chocolate and peanut butter treats. I would also happily use more Pure Dark Slab Chocolate in my future baking (and just pray for a more reliable recipe next time, haha... I really thought I could count on Martha). See, the chocolate batter actually held together well, but the peanut butter filling simply went amuck! I would like to give a shout-out and pass these on to some of my fellow bloggers. 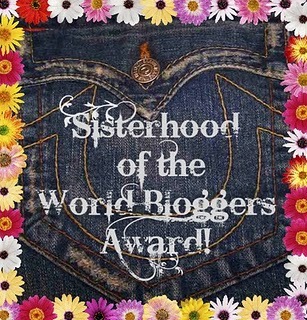 I decided that this time around I would share it with bloggers who I haven't awarded yet in the past, so no repeats! Some of these are blogs I've only discovered recently, but I'm sure glad I did! If you haven't visited these blogs in the past, I hope you will now! I am a brunch fiend! It's my favorite meal (probably because I eat it more rarely than other meals) and I love going out with friends, and also cooking brunch foods at home. I personally own quite a few brunch and bakery cookbooks, sharing recipes for everything from omelets to croissants. If you eat it for breakfast, I probably have about 20 different recipes for it. But there's always room for more, right? I recently had an unforgettable brunch experience at Clinton St. Baking Company, on the Lower East Side of Manhattan. I couldn't resist picking up a copy of their recently released cookbook to review. There were so many menu items that I had wanted to try, so making them myself is a great idea! First of all, in the recipe for Cherry Crumb Muffins, the recipe says it makes 10 muffins, but then tells you to reserve 8 cherries for topping the muffins. I'm gonna go out on a limb and say you should reserve 10 cherries (if it indeed makes 10 muffins) so 2 people aren't left out of the cherry love. Just sayin'. I also thought it was unusual that the Vanilla Buttermilk Waffle recipe does not actually contain any buttermilk. It specifies to use the pancake batter recipe, and then adds a few additional ingredients to it, none of which include buttermilk. I wonder if they perhaps replace the milk in the pancake batter recipe with buttermilk for their waffles, but nothing of the sort is explained in the book, so I can't help but wonder what makes them "buttermilk" waffles. Lies? Hmmmmm. The first recipe I made from the book was the Buttermilk Biscuits. I personally have issues with using vegetable shortening because it is a hydrogenated fat, and after learning all the horrible things about consuming these unnatural fats, I would feel pangs of unease if I actually use them in my cooking. Basically, hydrogen atoms are added to liquid fats to make them more solid. They create margarine and vegetable shortening this way, among others. The human stomach is challenged when attempting to digest these fats because they are chemically altered, and we're not designed to be able to digest them. While we have no problem digesting butter, and other naturally occurring fats (whether solid or liquid), when faced with hydrogenated fats that are unnaturally made solid, it's almost like our stomachs are trying to digest plastic. Nothing about that sounds appetizing to me. I personally love the taste of all-natural butter (puh-lease, who doesn't?!) so I like to make all-butter pastry crust and, in this case, all-butter biscuits. I simply substituted the shortening for more butter, and the biscuits came out fantastic! I know that the addition of shortening makes things flakier (in theory), but butter makes baked goods flaky too, so I'm sticking with my natural, NOT hydrogenated fat for my baking needs. The recipe also said to use a 2-inch cutter to cut out the biscuits, which is just fine for regular/small biscuits, but if using these for a sandwich (as the book also does in its Buttermilk Biscuit Sandwich recipe), I think that's too small. The pictures of the open-faced biscuit sandwiches appear to be the size of a hamburger, far larger than if the biscuits are made at the size specified. Also, the amount of egg suggested for each sandwich is way more than what would fit (even heaped) on one of the biscuit halves. I made my biscuits 2 1/2-inches in diameter, and yet they were still too small to hold all the eggs. We used 5 eggs to make 6 biscuit sandwiches (on the slighter larger biscuits), while the recipe for biscuit sandwiches would originally require 9 eggs for 6 biscuit sandwiches. That would not fit on the small biscuits, trust me. Otherwise, the biscuits were so flaky, buttery, and delicious, and were the perfect vessel for our scrambled egg, melted Jack cheese, guacamole and salsa sandwiches :) I adapted the original biscuit sandwich recipe and gave it a Southwestern twist. I would definitely make the buttermilk biscuits (at any size!) and the biscuit sandwiches again in the future. They were awesome and very easy to make. Just need to scale back the eggs a bit. *Note*: I have since also made the Whole-Wheat Buttermilk Biscuits, using a 2 1/4-inch cutter, and they turned out really well also. For this pancake adventure, I decided to make the Crunchy Bananas and Cinnamon Chili Chocolate Sauce topping, definitely putting these flapjacks over the top (I halved that recipe too, and it definitely made plenty!). These were some of the most decadent and delicious pancakes we've ever had!! It took a little effort to put together all of the elements... making the pancake batter first and refrigerating it, preparing the cinnamon-spiked banana batter and the chocolate sauce, deep-frying the bananas while cooking the pancakes, and then assembling it all. When it finally comes together, however, these pancakes will knock your socks off. The cinnamon and chili pepper (we used cayenne) add some delicious spice to the rich chocolate sauce, while the crisp, molten banana is doused in cinnamon-sugar, a final glistening touch. These pancakes could make men, women, and children fall to their knees to praise the pancake gods. It's not unlike a religious experience. My final thoughts on the cookbook are these. The recipes I've tried so far work. They yield really delicious results, however, I have found that some of the sizes and proportions seem a little off to me, as in, the size of the biscuits they ask you to make are simply too small to realistically make the biscuit sandwiches as they specify, and the amount of pancake batter in the full recipe makes way more pancakes at the size specified, than the recipe says it will. With the exception of these faults and a few others, the recipes I have tried actually turned out so well that I'd be crazy not to make them again! *Note*: For my updated review, including thoughts on several more recipes, go here. Place the flour, baking powder, sugar, and salt in a large mixing bowl and stir to combine. Add the cold butter and work it into the flour mixture, using your fingers or a pastry cutter, until the mixture resembles coarse pea or dime-size crumbs. Be careful not to overwork the mixture or the butter will soften too much. Add the buttermilk, and use your fingers to combine it into the dough. Powder your hands with flour if the dough gets too sticky. The dough should just come together, do not over mix. Pat the dough into a 3/4 to 1-inch thick rectangle. Use a 2 to 2 1/2-inch round biscuit cutter to cut out several biscuits (do not twist the cutter, cut straight down). Place them on a parchment paper-lined sheet pan. Gather the dough scraps, smooth them out (lightly knead if necessary), and pat the remaining dough into another 3/4 to 1-inch thick rectangle or circle. Cut out more biscuits, and then repeat again if necessary to use remaining dough. Do not over work the dough each time, or the final biscuits will be tougher. Lightly dust the tops of the biscuits with a sprinkle of flour. Bake the biscuits, rotating the pan front to back halfway through, for 15 to 22 minutes (depending on their size), or until they are golden brown and cooked through. Serve warm. Sift flour, baking powder, sugar, and salt into a large bowl. In medium bowl, whisk together egg yolks, milk, melted butter, and vanilla until combined. Whisk the wet mixture into the dry mixture until just combined; batter will be slightly lumpy. To make the chocolate sauce: Melt the chocolate, corn syrup, half-and-half, butter, vanilla, chili powder, and cinnamon together in a double boiler (a stainless steel pot set over a pot of simmering water will do just fine). Mix until smooth. Keep warm until ready to serve. To make the crunchy bananas: In a large bowl, whisk the flour, cornstarch, baking powder, cinnamon, and salt. Whisk in the seltzer water and set aside. Fill a small Dutch oven about 1/4 full with oil and heat to 350 degrees F. Roll the banana halves in the batter to coat. Gently dip 2 banana halves into the oil and fry for 2 to 3 minutes, or until the banana turns golden brown and crisp. Use a slotted spoon or skimmer to agitate the bananas every 30 seconds or so, so they do not burn on one side. Place the fried bananas on a paper towel-lined plate, and fry the remaining banana halves in the same way. Slice the bananas on the bias into 1-inch pieces and sprinkle them with cinnamon sugar. 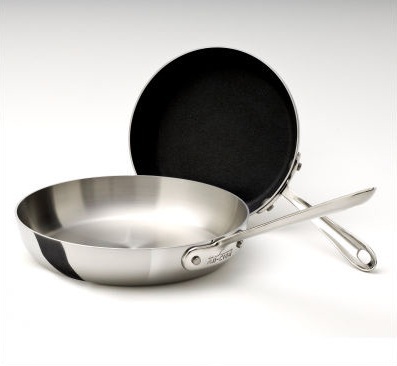 Heat a griddle (either an electric griddle, a stovetop griddle, or a big flat pan) until hot, about 350 to 375 degrees. Add some unmelted butter to the hot griddle. Add 1/4 cup pancake batter to the griddle and let it set. When bubbles begin to form on top, lift the pancake; if golden brown on the bottom, flip it over. Cook until golden brown on other side. Transfer cooked pancake to a plate and keep warm. Repeat process with remaining batter. Garnish with cinnamon chili chocolate sauce and crunchy bananas. I'm going to come right out and say it. I hate Valentine's Day. There. I said it. When you're single, you don't have a special someone to take you out or make you a fancy dinner. Valentine's Day is just like any other day. I'm okay with that. I'm very independent, and don't mind taking care of myself, on Valentine's Day or any other day. Lucky for me, I'm a good cook, and can make myself a nice dinner, no man required :) This Valentine's Day, I scaled down this salmon recipe, and cooked myself a beautiful Sockeye salmon fillet with some sautéed broccolini, including some bright and seasonal oranges into both dishes. The original recipe says to use skinless fillets of salmon, but I left the skin on mine. Pan-roasting fish in this manner yields an incredibly crispy skin, so I don't see the need to remove it (as long as it's been scaled first) unless you prefer to based on your personal preference. The vinaigrette boasts a strong sweet orange flavor, which is a great substitute to the traditional lemon often used for fish. I only had fresh parsley on hand, so I replaced the fresh basil and mint with parsley when I made it, but you can use all three or just use what you have available. It will taste great either way. I loved the addition of bright green, crisp broccolini to my redder than red salmon. Toasting up some panko crumbs in a separate skillet and then topping the vegetables adds a great (but messy) textural element and allows you better control to ensure that both components are cooked correctly and then married together. Even when plated with the salmon, and some of the vinaigrette absorbed into the panko, it was crispy enough that it still maintained it's texture while becoming even more flavorful with the extra hit of citrus. Overall, this was a very fast and easy dish to put together, showcasing bright colors, flavors, and textures, much like the wonderful Phyllo-Wrapped Salmon recipe I shared last week. Both of these are great, simple, and yet impressive salmon recipes from two wonderful cookbooks. Sockeye salmon fillet... love the deep red color! Combine all the sauce ingredients in a glass jar, cover tightly, and shake vigorously. Reserve. Season the salmon with salt and pepper to taste. In an oven-proof skillet large enough to hold all the salmon, heat the olive oil over high heat. Place the salmon in the pan with its skin side down. Transfer the pan to the oven and roast for 8 to 10 minutes, until medium-rare, or longer if desired. Transfer the cooked salmon to a serving platter and keep warm while finishing the sauce. Wipe out any remaining olive oil in the skillet and add the sauce. Heat through for a few seconds over high heat, spoon the sauce over the salmon, and serve. Bring a pot of water to a boil over high heat. Salt the water and add the broccolini. Blanch for about 2 minutes until tender, but still firm and bright green (do not overcook). Drain the broccolini and immediately immerse in a bowl of ice water to shock the cooking, and retain it's bright green color. When cool, drain broccolini again, and set aside. In a small skillet, heat 1 T. olive oil over medium heat. Add the orange zest and onion, and season with salt and pepper. Sauté for 1 to 2 minutes to infuse the flavors into the oil and slightly soften the onion, but do not overcook or the zest will begin to burn. Immediately add the panko to the pan, and sauté for another 2 minutes until the panko turns golden brown. Remove from the skillet and set aside. In a large non-stick skillet over medium heat, add the remaining 1 T. olive oil. Add the blanched broccolini, season with salt and pepper, and sauté for about 4 to 5 minutes until the broccolini is heated through and is starting to lightly brown on some sides. It should still be bright green with some browning. Do not overcook. It should still have a bite to it at the thicker end of the stem. Remove the broccolini to serving dishes and top with the orange-panko mixture. Serve immediately. I love cooking various international cuisines, but one of the most exciting for me is Indian cuisine. When I first tried making Indian food, I found it to be a bit of a challenge, trying to make it truly authentic tasting without a single Indian bone in my body. My first attempts at making Chicken Tikka Masala (though I've often read that this is really a bastardized Indian dish, and not truly authentic) did not result in the same spicy and creamy curry that I love. It just wasn't quite right, too watery, etc. I didn't give up on Indian cooking, though, and kept trying. Over time, I have created many other Indian dishes I love, and even hosted a very successful Indian feast at my last birthday!! I also recently shared a really delicious and easy recipe for Dal Makhani, the Queen of all dals. I am inspired by visits to "Curry Hill" in Manhattan, where I not only dine on wonderful food, but visit Kalustyan's to pick up various authentic ingredients for dishes I am dying to create! This is where I buy the ingredients I either can't easily find at supermarkets, or ones that are simply superior quality because they are sold in this specialty shop rather than an alternative venue. I have purchased a variety of lentils/dals and spices here that I know would be inferior or unavailable elsewhere, and fortunately for my non-New York readers, Kalustyan's sells their products online (they even sell the elusive "black garlic" here)! For the chana dal recipe I'm about to share, I not only purchased the actual dal at Kalustyan's, but I also got the fresh ginger, ground turmeric (they sell 2 dry varieties here, as well as fresh turmeric root), garam masala, and Indian red chili powder. While the first several ingredients are more readily available these days at other markets, I've never seen Indian red chili powder at a supermarket, and was so pleased that I had the option of purchasing it and using it in my future Indian cooking (FYI, Kalustyan's sells about 30 varieties of dried chilies and chili powders, ones I've never seen anywhere else)! Whereas a lot of Indian recipes may call for chili powder, they are generally not referring to the Southwestern or Mexican chili powders that most of us associate with the term. This is not a spice blend, but instead is simply dried and ground Indian red chilies (which also means it's spicier than chili powder blends, so be ware!). *Note*: This recipe calls for chana dal or yellow split peas, but they are not the same thing. Chana dal is obviously preferable, but if it is unavailable, you can substitute with yellow split peas. Put the dal in a heavy pot along with the water. Bring to a boil and remove any surface scum. Add the turmeric and ginger. Cover, leaving the lid slightly ajar, turn heat to low, and simmer gently for 1 to 1 1/2 hours or until the dal is tender. Stir every 5 minutes or so during the last 30 minutes of cooking to prevent sticking. If the dal is too liquidy, remove the cover and raise the heat to medium toward the end of cooking, allowing it to reduce and thicken. Remove the ginger slices. If you like your dal on the thicker side, use the back of a wooden spoon to slightly mash up some of the dal to thicken it a bit more. Add the salt and garam masala to the dal. Stir to mix. Heat the ghee in a small frying pan over medium heat. When hot, add the garlic. Stir and fry until the garlic is golden. Add the ground cumin and chili powder into the pan. Immediately lift the pan off the heat and pour the mixture into the pot with the dal. Stir to mix. Serve hot with basmati rice or Indian bread, such as naan.